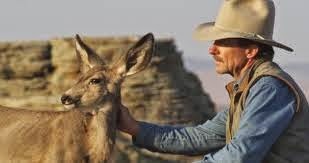 There was a film on public TV the other evening about a man and his mule deer "family." Now it's not uncommon for dogs and cats to become part of the family, or other domesticated animals like cows or sheep, or even fish or parrots. But these weren't domesticated mule deer. They were in their natural element and the man in the film went to them. It took two and a half years of Joe Hutto quietly and unobtrusively observing the deer in their environment, before one of the females, the leader of the small herd, made her way to him and initiated first contact. 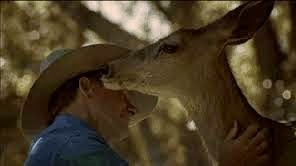 In the film, Hutto presents and narrates his story of bonding with the deer. Taking place in the Wind River Mountains of Wyoming, near his ranch, the relationship with the herd develops over the space of seven years. He knows the names of all the deer in the herd and they respond to his naming when he calls them. He grieves when they fall prey to illness or predators or hunters. He celebrates the birth of each new generation. He models a way of being with other creatures that reminds one of indigenous ways and resonates with the duty in Genesis to name and care for the creatures. I was moved by Joe's story. It reminded me of the caretaker of the bison herd on the Cheyenne River Reservation. When a group of us met with him, he spoke about sitting and watching the herd. He observed family interactions. He became knowledgeable about characteristics of individual animals and gave them names. He observed the dynamics between males and females and the dynamics of power and leadership. He spent hours watching and listening, just observing. He knew the herd. I was moved enough by Hutto's story that I've tried to be more observant today. There were several minutes spent at the kitchen window watching the mourning doves warm their wings and bodies after a cold and snowy night. And like a year ago, I observed a territorial robin. Maybe it's the same one from last year, fat and not able to eat all the raisins we'd put out, but unwilling to share them with any other. This morning the fat one kept another robin from approaching the feeder. Christopher Smith and Merete Mueller are part of a tiny house movement. They have constructed their house in Colorado. Using recycled materials from thrift stores and junkyards and supplies from IKEA and hardware stores, they recently hosted a tour of the 127 foot space. I think they have a hankering for the wild things. They are part of a growing number of young people who want to live as much as possible off the grid, in God's creation, not man's. 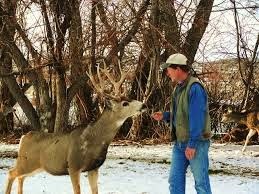 How can you get to know mule deer or birds if there aren't any where you live? And how much time do we have left to know any wild creatures, given the exponential nature of species extinction as humans take up more and more of our global space? And how much poorer are we with each new disappearance? I've come to appreciate the thinking of Saint Bonaventure on the nature of the creatures. A Franciscan, he followed in the footsteps of his namesake Saint Francis. He appreciated the other than human creatures. For him, creatures were the "footprints" of God. And for Bonaventure, we needed each and every one of them in order to recognize the glory and grandeur of God. The loss of any species diminished God's glory. The good saint may have been one of the earliest environmentalists, motivated by a spiritual grounding, as are many environmentalists today. On my first trip to India I learned something new about personal space. Going from Aberdeen, SD, after college, to Seminary in New York City, was one kind of transition. You could have put all of Aberdeen in Grant Houses, just down Broadway from where we lived. But getting off the plane in Mumbai, India and trying to get through customs, I had my first experience of not knowing where my body ended and another body began. That rather mystical and intensely physical experience occurred a second time on a train leaving a Mumbai station. When you live in a country with one fifth of the world's population, your sense of personal space is reduced, of necessity. Unfortunately, as a larger human community, we are encroaching unceasingly on the space needs of all of the wild things. Witness the belligerence of Cliven Bundy, the rancher in Nevada, USA, who believes he has a right to graze his cattle wherever he pleases, endangered species and the public interest be damned. And as humans continue to populate the planet and exploit it's resources, land and soil, water and ancient mineral deposits, there is less and less space for the wild things. And something fundamentally human and intimately religious is lost. Psalm 24 reads, "The earth is the Lord's and the fullness thereof." You don't have to be religious or Native American or a reader of Scripture to recognize that we don't own, and can't own, what's wild and free. Like Joe Hutto, we can watch the wild things and treat them like family. But ultimately, they have their own place in a world that should be, large enough for all. As humans, maybe we need to construct tiny houses, limit our rapacious desire for "more" and observe the glory that's still around us.